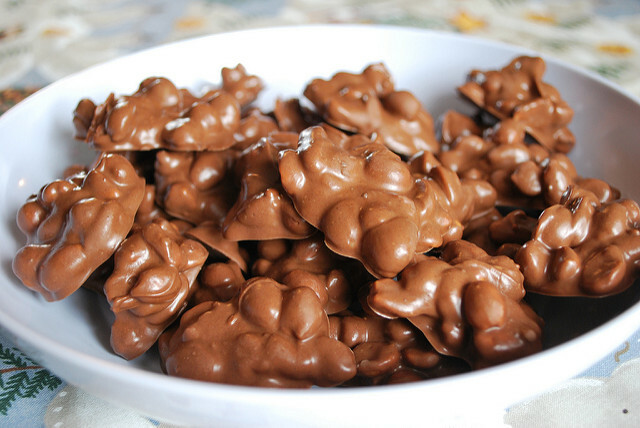 This Crockpot Candy recipe is great for the holidays. I honestly had no idea it was so easy. It’s 4 ingredients, the slow cooker does everything for you, and it’s delicious. And I’m not gonna lie, I can’t stop eating it! It is seriously addictive. I crave it all year long. The recipe only calls for peanuts but you can use a mixture of peanuts and pecans. I stuck with only peanuts, my favorite. Also, I halved the batch and got a ton (as you can see from the picture below) so if you make a full batch, be ready to eat a lot of peanuts!